The Evangelical Christian Publishers Association (ECPA) announced tonight the winners of the 2015 Christian Book Awards® and the 2015 Christian Book of the Year™ — representing the best Christian book and Bible releases of the year in Non-Fiction, Fiction, Inspiration, Children’s, Bible Reference, Bibles, and New Author. The announcements were made at the ECPA Awards Banquet, held in conjunction with the ECPA Leadership Summit hosted in Murfreesboro, Tenn. 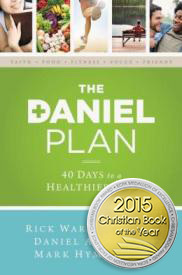 The highest honor of Christian Book of the Year™ went to The Daniel Plan by Pastor Rick Warren (with Daniel Amen M.D., and Mark Hyman M.D.). The New York Times bestseller with a strong and regular presence on the ECPA Bestseller list, is described as “creating a health plan” that adds faith, focus, and community to the usual “food and exercise” approach to weight loss and health. The plan is credited for helping 15,000 of Warren’s church members lose 250,000 pounds in the first year. Warren is the author of The Purpose Driven Life, the highest bestselling non-fiction hardback in publishing history with more than 32 million copies sold. This year’s Jordon Lifetime Achievement Award went to Dr. Lane T. and Mrs. Ebeth Dennis. For their remarkable contributions to Christian publishing, and in recognition of a lifetime of service to Christ and excellence in gospel ministry, ECPA President/CEO Mark Kuyper presented Dr. Lane T. and Mrs. Ebeth Dennis the industry’s Jordon Lifetime Achievement Award on May 5 in Murfreesboro Tennessee, at the ECPA Awards Banquet held in conjunction with the ECPA Leadership Summit. See all the 2015 winners click here. Mark Kenny at thepunch.com.au has an article about how Tuesday’s debate will mean people now see Kevin Rudd as a “clever politician”, a title from which John Howard never recovered. That has to be good for Tony Abbott … um … I think mainly because no-one would ever accuse him of being clever. And also Kevin Rudd doesn’t know about the Hey Dad guy being a serial molester, while Tone is right up there with the people holding the torches. JÃ¡ tinha pensado nisto. Estou de pleno acordo. Anunciar o vice Ã© pressÃ£o da turma da Dilma! A oposiÃ§Ã£o tem que usar o tempo e escolher o melhor momento.